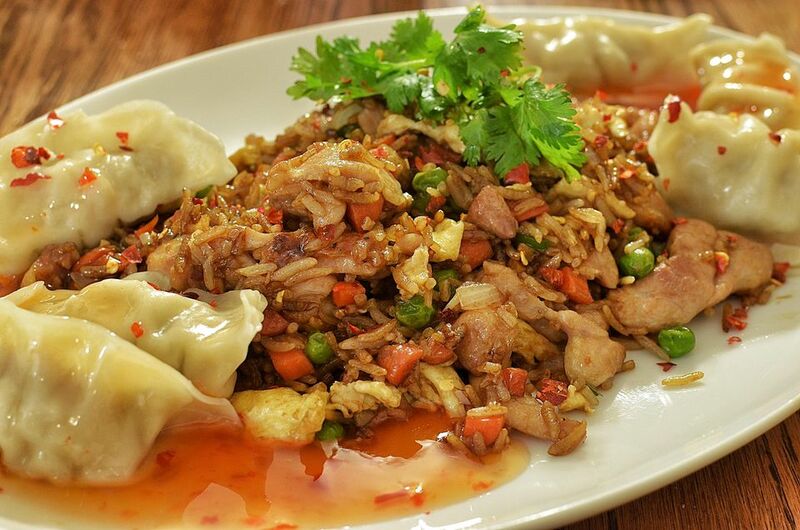 Chicken fried rice is a great way to use leftovers. Like all fried rice dishes, chicken fried rice tastes best when using leftover cooked rice. Makes 3 servings of chicken fried rice, or 4 - 6 as part of a meal. Heat wok and add oil. When oil is ready, pour 1/2 of the egg mixture into the wok and cook over medium heat, turning over once. Cook the other half the same way. Cut the egg into thin strips, and save for later. Add oil, turn down the heat to medium and stir-fry the rice. Add the soy sauce, salt, pepper and oyster sauce. Add the chicken, onion and green peas and combine thoroughly. Serve chicken fried rice with the strips of egg on top and the green onion as a garnish. (Alternately, you can mix the green onion and egg in with the other ingredients).